So, this young chocolate maker named "Sivonne Imnottelling" contacted me today about their brand new confectionary line called Sweetly Demented, ranging from the "morbid, shabby chic & just plain rude." 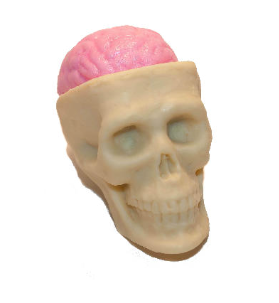 There are chocolate bird skulls, brains, hypno pops and...well, you'll have to see for yourself. I find it creative, dark and charming in a raw, art school kind of way. Wow, great review and a really nice image! They look amazing......but very spooky!